Step onto the pavement on a hot day and you might get a sense of the energy that Scott and Julie Brusaw hope to tap into. The Idaho couple are thinking up a way to pave the country's roadways with solar cells, rather than asphalt or concrete. 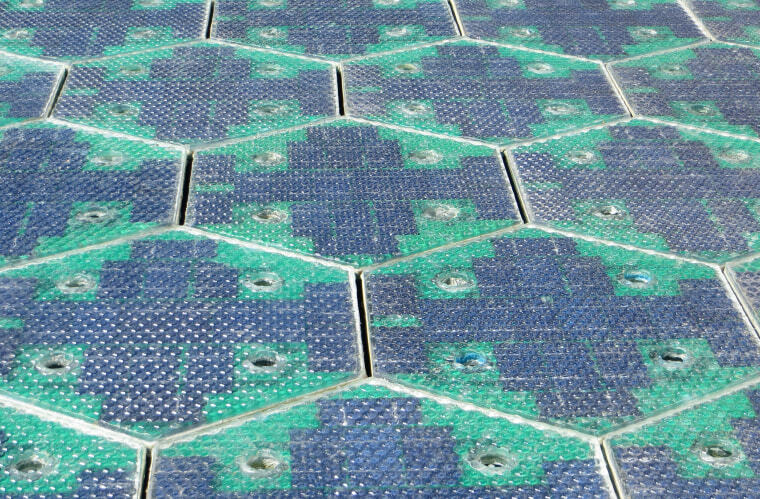 The so-called Solar Roadways are an edgy idea that the entrepreneurs said could replace much of the need for traditional sources of generating electricity in the U.S., including coal-fired power plants. "Years ago, when the phrase 'global warming' began gaining popularity, we started batting around the idea of replacing asphalt and concrete surfaces with solar panels that could be driven upon," according to the Solar Roadways website. Translating that into a practical solution hasn't been easy, as it isn't as simple as taking solar cells off of a rooftop and burying them into the pavement. Scott Brusaw, who was trained as an electrical engineer, has come up with a hexagonal block that contains a solar cell protected by a thick glass cover. Add LEDs, and there would be no need to paint lines or messages on the roadway. Small heating elements could also be installed in colder climates. Laid out like pavers, he contends, they are strong enough to support a truck weighing as much as 250,000 pounds. And with an estimated 29,000 square miles of roadways making up the U.S. landscape, according to Solar Roadways, the couple claims that if they were all converted to the solar pavement system, there'd be enough power to eliminate the use of fossil fuel generators. The transition wouldn't be cheap. Scott estimates the cost would run anywhere from 50 percent to 300 percent more than the cost of using asphalt to pave a roadway. How the material would stand up to weather, road salt in colder climates, snowplows, crashes and other challenges also remains to be seen. While there are plenty of skeptics, the Brusaws also have been gaining backers. They've secured several grants from the Federal Highway Administration, including one for $750,000 in 2011. They've since turned to the Indiegogo crowdsourcing site for more support, and the reception has substantially exceeded their $1 million goal. As of Friday, Solar Roadways had already pulled in more than $1.6 million from more than 38,000 supporters, a record for the most individual contributions to a single campaign. While the Brusaws want to use roads to generate electricity, others see a way to provide electric power through the roads to power battery vehicles. That could be a major breakthrough for proponents of alternative energy, offering a way to overcome the limitations of battery-based vehicles. Volvo is pairing up with the Swedish Transport Association to create short stretches of electrified roadway in Gothenburg, the Scandinavian country's second-largest city. Using a concept called inductive charging — essentially, what's used to wirelessly charge many electric razors and toothbrushes — specially designed city buses would simply have to drive along dedicated portions of pavement to partially replenish their batteries. Because there are no exposed wires, the system would be safe for humans and animals, who might inadvertently walk across the chargers. Other induction charging systems have been put to use in several locations, including Utah; Turin, Italy; and Gumi, South Korea, with more under study. Longer-term, proponents believe the technology could be incorporated into highways for use by electric passenger cars such as the Nissan Leaf and the Tesla Model S — perhaps built into existing high-occupancy vehicle (HOV) lanes or dedicated lanes for use by battery cars only. Right now, such induction charging systems have to be linked to the conventional electric power grid. But the Brusaws have suggested that they could combine in-road chargers with their solar roadways, eventually allowing highways to both generate power and use that energy to operate a fleet of zero-emission cars, trucks and buses.